When it comes to placing your mission-critical systems and applications in the cloud, do you know what’s behind the scenes? Do you know if your data is secure? Who do you trust? You’ll learn how spinoff-turned-startup Bioventus stood up a cloud-based infrastructure for its global operations in just five months (page 10). You’ll see how GoodMills is using the cloud to advance its vision of a real-time pricing model (page 16). 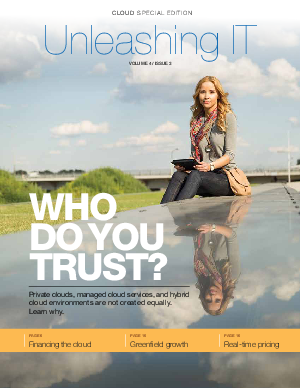 You’ll learn how cloud services have helped U.S. Auto increase its sales by 20 percent (page 14). And you’ll hear how a prominent law firm turned a $3 million fire disaster into a host of cloud-based business opportunities (page 20).